If you feel about the Stephansdom in a similar way as I do - that it is an utterly un-impressive building - you might want to check out the Peterskirche just around the corner on the Graben street. 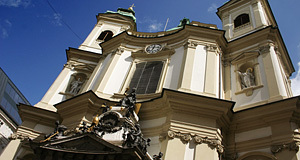 This Baroque church with a longstanding history is generally considered to be the second-most significant Baroque church in Vienna after the Karlskirche Church. The first sacral building erected on the site was an early medieval church that might make the Peterskirche the oldest church of Vienna - in a way. According to legend, the Peterskirche was founded by Emperor Karl the Great (Charlemagne) in 800, the year of his coronation. Modern historians do not believe this story. The first written record of the church dates back to 1137. Towards the end of the same century, the Peterskirche became the property of the Schottenstift Monastery. The nave of the medieval church was oriented towards South and not towards East as essentially all other churches in Europe are. The reason for this is unclear and the subject of a longstanding argument among archaeologists. One possible explanation would be that the church had originally been a non-sacral building that was adapted for religious ceremonies and later became a church. Around the original Peterskirche, there used to be a market and the headquarter of the "Stadtguardia" (city guards) as the ancestor of modern police. In 1661, the ancient church burnt down and was restored to become usable again. It must have been in very poor shape, though, and in 1676, the newly arrived Brothers of the Holy Trinity decided to build a new Peterskirche. The erection of the new and current building started in 1701. The first architect was Gabriele Montani, but in 1703 he was replaced by Lukas von Hildebrandt. Hildebrandt was - alongside with Fischer von Erlach - the most important Austrian architect of the Baroque age. By 1722, the church was almost finished and had become the first church with a central cupola in Vienna. Its characteristic oval shape provides a lot of space for the crowds who can marvel at the ornaments by Matthias Steinl. The current frescos were painted by Austria′s most important Baroque painter, Johann Michael Rottmayr. The main altar was built by Antonio Galli-Bibiena and the altar painting was made by Martino Altomonte. Between 1998 and 2004, the Peterskirche was renovated extensively, which means that it is now in very good shape and ready for the crowds starving for sightseeing attractions. Nearby attractions include the Trinity Column, the Hofburg palace, the shopping lanes of Kohlmarkt, Graben and Kärntnerstraße, the Stephansdom, the Ankeruhr Clock and the general prettiness of Vienna′s first district. The National Opera is not too far either. If you want to check out more Baroque churches, try the Karlskirche, the Jesuitenkirche, the Dominikanerkirche or go to Salzburg, where everything is Baroque (even the people) anyway.